Join the discussion on our forums! Come discuss Crazed Chemist over in our dedicated Crazed Chemist discussion topic. Meh, rogue already uses Cobalt Scalebane and Fungalmancer to buff things. Plus with Vilespine Slayer their 5 mana card slot is pretty full. Her smile indicates that the liquid should be white. I think boomsday might on average have some of the best art of any expansion. That said, this is the worst art in boomsday in my opinion, and is just about King of Beasts level. It's weird, because the other cards this artist has done look pretty good, like Fungal Enchanter and Flobbidinous Floop. Card's alright. It might be played over Cobalt Scalebane, but I think this card's a tiny bit worse. Really? This is my favorite artwork so far. This card is very bad. Well imo is a pretty good card overall, a Dark Iron Dwarf for rogue only, a 5 mana ''8-4'' looks decent for me, maybe some Odd rogue can take one of this, maybe it fills better in a Keleseth oriented deck since Keleseth already lost his big drops like Bonemare. As a buff, it's a lot less flexible than Cold Blood because it costs 5. As a tempo play, worse than Fal'dorei Strider and Hench-Clan Thug. It faces stiff competition for a deck slot from Vilespine Slayer, Fungalmancer, and Cobalt Scalebane. And it doesn't even have a particularly creative name. 1. For lethal with Leeroy Jenkins. 2. For early dmg with Firefly. 3. Uncommonly, on Southsea Deckhand to threaten lethal. SO, this card is only applicable to one of these scenarios. This will only work with Southsea, and it's otherwise a dead card until turn 6, when you should be pressuring lethal and looking for Leeroy. Overall, too slow. Crazed Chemist seems pretty bad. If you end up playing it without a combo activation, it's a 5 mana 4/4, which is too weak, and if you play it with a combo activator you're getting the effect of Cold Blood (worth 1 mana) and a 4/4 body (worth about 3.5 mana). There's no way to play this card such that it is worth the 5 mana cost, so unless your goal is to have redundancy with your Cold Blood effects to push tons of damage, I just don't see it in constructed. It could be nice in arena, though. I think phrasing it as "additional attack is always welcome" is too narrow. I would rephrase it as "additional tempo is always welcome," because the stat boost represent a tempo shift. Under that construction, getting less than 5 mana's worth of tempo out of a 5 mana card is not that great, and there are way better options available to Rogue for the 5 mana slot (like Vilespine Slayer and Cobalt Scalebane). 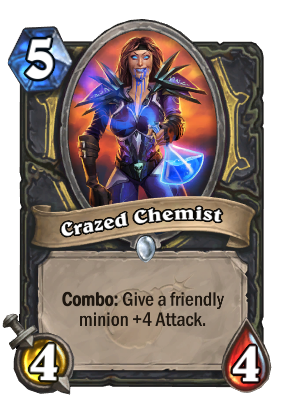 Consider the comparison of Crazed Chemist to Fungalmancer; each costs 5 and can add 12 stat points to the board. In principle, this means that Crazed Chemist is playable because Fungalmancer sees play, and that might be true in some metagames. However, Chemist requires a combo activation, and in most metagames Fungalmancer will be better because spreading the 12 stat points more evenly across bodies protects your board from single target removal without sacrificing much tempo. Additionally, the fact that Fungalmancer boosts health means you are far more likely to get value trades as a result of its buff. Is it Preparation for Cold Blood rotating out next expansion?